Reading this book took me by surprise, in the most welcoming way possible. At first glance I was a bit nervous by it's volume. Over 500 pages?! But then as I flipped through it, I realized that this book is uniquely told through illustrations as well. And what magnificent illustrations they were! This type of story does well being depicted through both words and pictures. It gives the reader an opportunity to connect with it by reading & creating visualizations on their own, but then adding their own story to the pictures as the novel continues. I found this type of story-telling to be rather interesting. Hugo Cabret's character has many layers. We begin witnessing his adventure as this young, intuitive, yet secretive boy. His whereabouts as to why he's maintaining the clocks inside this old Paris train station are soon revealed, and so are bits of the secret he keeps hidden among the walls. His adventures place him in the hands of an older gentlemen and his god daughter which he encounters inside the train station. One is desperately trying to conceal Hugo's secret, while the other is curious about it. The mention of the early days of film really intrigued me. I am a huge fan of the history of cinema. I recognized quite a few names and movie titles that were being passed around since the setting of the story was in 1930 Paris. The correlation between Hugo's secret, the characters he met along the way, and the beginning of film lifted the story and kept the momentum going. But it was the illustrations, the moments between the words, which captured the heart of the story. There is a greater depth here than what may first meet the eye. I was pleasantly taken back by this. I highly recommend this book for it's beauty in pictures, but also for it's deeper meaning that is eloquently expressed in both words and illustrations. I just read it too! Loved it. I was with you about being daunted by the book! It seemed quite thick for a children's book but once I opened it, I think I finished it in about an hour. I really like the illustrations and the next day, I watched the film version. It differed from the book slightly but it was very beautiful. The film aspect of the book intrigued me too. I think there's something so magical about it! I loved this book! I agree with everything you said! It is a wonderful book and well worth reading. I was also pleasantly surprised to discover that the filmmaker, Georges Melies, actually existed and his movies, including the one about the moon, can be downloaded for free online. If you haven't done so already, check out Selznick's Wonderstruck. 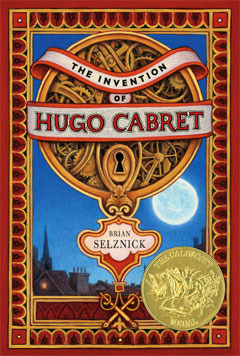 It is the same style as The Invention of Hugo Cabret and is another beautiful story worth reading. The title of this book was definitely enough to intrigue me. I've always wanted to read it, and now you've reviewed it in a way that makes me feel like I should. It sounds like a lot of fun!